To find O2 Academy Newcastle visit www.maps.google.co.uk Travel information in and around Newcastle visit www.visitnewcastle.org.uk Book Tickets: To purchase tickets in person, the O2 Academy Newcastle Box Office is open for cash ticket sales between 12pm ? 4pm, Monday - Saturday (until 6pm on Thursdays) (No booking fee charged on cash transactions). Public holidays may vary Door sales on the night of a show are CASH ONLY. Local outlet: Reflex Records 0191 260 3246 or www.reflexcd.c About A beautiful historic venue, AMG invested millions to restore the former City Centre bingo hall on Westgate Road in October 2005. Boasting a magnificent auditorium with original features in the ceiling and stairways and balcony, it really is a dramatic and atmospheric space. 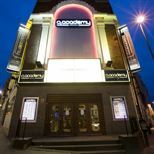 The venue also houses a secondary O2 Academy 2 Newcastle space with a production-complete capacity of 400 for showcasing new talent from the local area and breaking new acts on the touring circuit. Contact Us Box Office: 0844 477 2000 (24 Hr) Customer information line: 0905 020 3999 (25p Min) Email: boxoffice@o2academynewcastle.co.uk Tel: 0191 260 2020 For recruitment, visit Academy Music Group For press please email press@academy-music-group.co.uk For marketing and partnerships please email jonny@academy-music-group.co.uk Hotel Indigo Newcastle www.hotelindigonewcastle.com Now open! Hotel Indigo Newcastle is set to be the city's most exciting boutique destination to date. Positioned in the Grainger Town area (Fenkle Street), Hotel Indigo Newcastle boasts an enviable city centre postcode and is conveniently located just two minutes from Newcastle's Central Station and a mere 10 minutes from the glorious grounds of the Newcastle United Football Club, not to mention the many shops, bars and attractions of Newcastle town centre. This impressive, upscale venue has already set tongues wagging, with much attention featuring around the eagerly awaited Marco Pierre White Steakhouse Bar & Grill. This, along with our fresh, vibrant and modern approach to hospitality is what will ensure a enjoyable, refreshing and unforgettable experience by you, our guest.